Olympians compete during their periods, but stock images make menstruating women seem helpless. US figure skating champ Mirai Nagasu competes during her period, Madame Gandhi has free bled during a marathon, future UK princess Meghan Markle has toured the world to take on period stigma, and 22 senators, 84 representatives, and 3 Supreme Court Justices who are women help run the US government. So why do so many online images still depict menstruating women as weak, powerless, and crippled by cramps? That question inspired Pink Parcel, a UK-based pad and tampon delivery service, to commission a study to explore the scope of this stigma. When the results came in, they realized just how insidious such negative online content can be for girls and women and found that 40% of women say online representations contribute to period shame. Pink Parcel’s study reviewed period-related imagery on 100 websites — including Google, Bing, and the UK’s National Health Service and found that a full 91% depicted women as helpless. Indeed, a Google search of period-related images using the search terms “Period” and “Woman” reveals women curled up in the fetal position, anguished women with hot water bottles on their stomachs, and women doubled over in pain. Though extreme period-related pain can be a serious problem, the stock images don’t accurately depict the experience of half the world’s population. Women manage to work, compete in sports, and live normal lives despite period pain and discomfort. Global Citizen campaigns on ending gender discrimination and ensuring that every girl and woman has access to pads, tampons and other safe menstrual hygiene products. You can take action here. 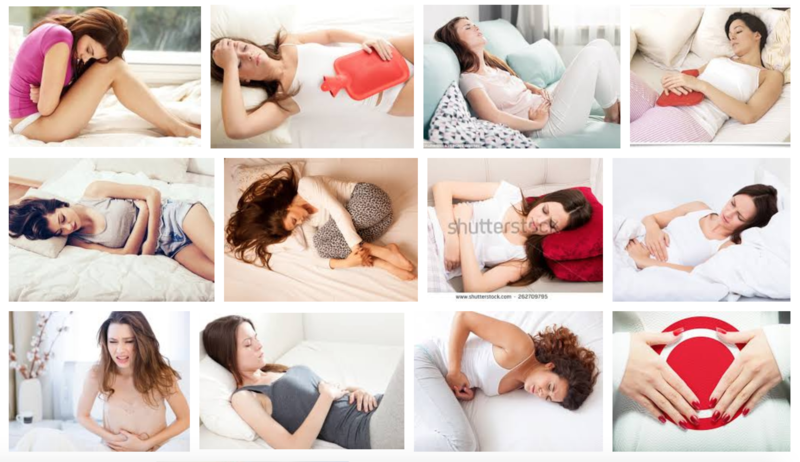 In response to the study’s results, The Debrief put together a handy slideshow of new period-related stock images that show what women on their periods really look like.